There are several ways to use SQL Server with Microsoft’s Azure cloud platform. Microsoft’s SQL Database service can be used to create Azure-hosted SQL Server databases, where the operating system and database engine is managed for you, or you can create a virtual machine (VM) running Windows Server with SQL Server installed, and store database files on virtual disks. 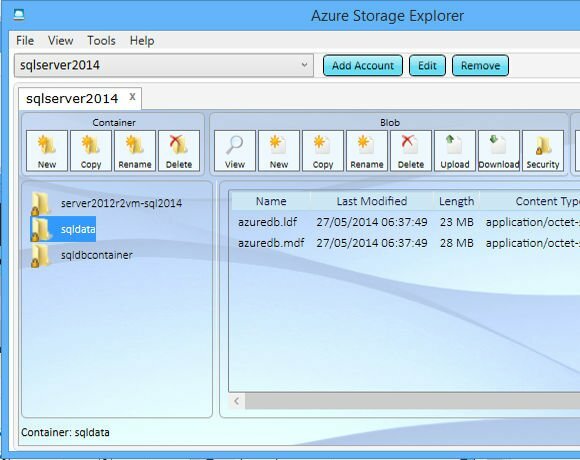 Now there is another option, which is to mount data files directly on Azure blob storage, a cloud storage service. This is a significant new feature in the database engine, mapping SQL Server I/O to Rest API calls. There is also a new credential manager in SQL Server for storing Azure credentials. Mounting SQL Server data files over the internet seems an odd thing to do, considering the latency and possible unreliability of such a connection, but this feature is mainly designed for SQL Server running on a VM in the same Azure region. In this context, using Azure data files bypasses the virtual disk driver and enables shared storage for cost-effective failover.